The conflict in Afghanistan has shifted into a fundamentally new phase. For the past 11 years, the United States and our coalition partners have led the fight against the Taliban, but now Afghan forces are conducting almost all combat operations. The progress made by the International Security Assistance Force (ISAF)-led surge over the past three years has put the Government of the Islamic Republic of Afghanistan (GIRoA) firmly in control of all of Afghanistan’s major cities and 34 provincial capitals and driven the insurgency into the countryside. ISAF’s primary focus has largely transitioned from directly fighting the insurgency to training, advising and assisting the Afghan National Security Forces (ANSF) in their efforts to hold and build upon these gains, enabling a U.S. force reduction of roughly 34,000 personnel—half the current force in Afghanistan—by February 2014. As agreed by President Obama and President Karzai at their January 2013 meeting in Washington, D.C., and in line with commitments made at the Lisbon and Chicago NATO summits, "Milestone 2013" was announced on June 18, 2013, marking ISAF’s official transition to its new role. The ANSF has grown to approximately 96 percent of its authorized end-strength of 352,000 personnel and is conducting almost all operations independently. As a result, ISAF casualties are lower than they have been since 2008. The majority of ISAF bases has been transferred to the ANSF or closed (although most large ISAF bases remain), and construction of most ANSF bases is complete. Afghanistan’s populated areas are increasingly secure; the ANSF has successfully maintained security gains in areas that have transitioned to Afghan lead responsibility. To contend with the continuing Taliban threat, particularly in rural areas, the ANSF will require training and key combat support from ISAF, including in extremis close air support, through the end of 2014. Challenges with the economy and governance will continue to foster uncertainty about the longterm prospects for stability. Afghanistan has made some progress over the past decade, as reflected in the recently released United Nations Development Programme Human Development Index, which cited Afghanistan as making the largest percentage gain in the world over the last 10 years. Moreover, the economy grew 12 percent in 2012, and the Afghan government is increasingly able to execute parts of its budget and deliver very basic goods and services. Nonetheless, Afghanistan remains one of the poorest countries in the world and will remain heavily dependent on outside aid. The government has yet to reduce corruption or extend governance to many rural areas effectively. Given the expected decline in international assistance, Afghanistan will need to embrace new sources of future economic growth and government revenue. The security situation also remains challenging: Afghanistan continues to face a resilient insurgency that uses sanctuaries in Pakistan to attempt to regain lost ground and influence through continued high-profile attacks and assassinations. Although ANSF capabilities have greatly increased over the past two years, it has yet to demonstrate the ability to operate independently on a nationwide scale. Therefore, the Afghan government will require continued assistance from ISAF and the international community over the next year and a half to help enable it to address these challenges and improve long-term prospects for stability. While relations between Afghanistan and the U.S. have at times been turbulent during this period, negotiations have made progress on key issues. Assessing whether the gains to date will be sustainable will be difficult to do until the exact size and structure of the post-2014 US and NATO presence is determined. Another key factor in this assessment will be whether a Bilateral Security Agreement (BSA) between the U.S. and Afghanistan is reached. ISAF’s main effort is to facilitate the conditions for the ANSF to assume full security responsibility for Afghanistan by the end of 2014. Of all lines of effort, this showed the most progress during the reporting period, culminating in the Milestone 2013 ceremony that formally marked the ANSF's assumption of operational lead for the 2013 fighting season. The ANSF has grown in size and capability in accordance with ISAF’s development plan. Initial force generation and training of the ANSF’s basic infantry and police force structure by ISAF is largely complete and has largely transitioned to the Ministries of Defense and Interior, which now conducts 85 percent of ANSF training. The Afghan National Army (ANA) Command and Control (C2) system has advanced to an adequately resilient level and is capable of providing the minimal essential support required for the transition to Afghan lead in plans and operations by 2014. The ANSF will, however, need continued assistance and combat support through the end of the ISAF mandate in December 2014; beyond then it will still require substantial training, advising and assistance—including financial support—to address ongoing shortcomings. Some of these include the ability of the ANSF to operate and sustain some of the more complex and technologically advanced capabilities that will be fielded, such as logistics, air support and artillery. ANSF components responsible for these more complex tasks, particularly air operations, will not be capable of fully independent operations by December 2014. In addition, the security ministries face long-term challenges in building up the personnel and bureaucratic structures necessary to manage the ANSF effectively and in training and deployment of officers and non-commissioned officers (NCOs), particularly in the more complex occupational areas such as aviation and logistics. During the reporting period, the ANSF has performed effectively in the field, losing no major bases or district centers to the insurgency and protecting the majority of the Afghan population. Although challenges remain, the ANSF demonstrated an increasing level of effectiveness. The ANSF led almost 90 percent of operations by the end of the reporting period and is already in the lead for security in areas covering nearly 90 percent of the Afghan population. The ANSF has incrementally increased its capability to plan, conduct and sustain large-scale joint operations. One example of this was Operation KALAK HODE VI in Regional Command–South (RC-S). This 10,000-person joint operation, which focused on disrupting the insurgency, involved coordination among the Afghan Army, Police, Border Police and National Directorate of Security. The ANSF principally planned, led and manned the operation; Afghan-managed logistics and supply channels supported it. The number of insider attacks declined sharply during the reporting period. Thus far, these attacks have not significantly affected the strong relationship between coalition and ANSF personnel, particularly in the field, where they face a common enemy every day. Coalition forces and the ANSF are working together on a comprehensive, combined response to insider threats and have implemented several mitigation measures. Our current assessment is that these measures are having a positive effect, although continued emphasis is required to maintain progress against this threat and ensure it does not jeopardize ISAF-ANSF cohesion. The insurgency failed to achieve its campaign objectives during the reporting period and its ability to strike at major population centers is increasingly under pressure. Taliban territorial influence and control decreased in 2012 and continued to do so during the reporting period. The enemy is now less capable, less popular and less of an existential threat to the Afghan government than in 2011. Nonetheless, insurgents maintained influence in many rural areas that serve as platforms to attack urban areas and were able to carry out attacks with roughly the same frequency as in 2012, although these attacks tended to be in less populated areas. The insurgency can also use its sanctuaries in Pakistan to prevent its decisive defeat in the near term. But the ANSF's growing capability has enabled it to successfully challenge the insurgency across Afghanistan and hold the security gains made in the past two years. During the reporting period, sustained counterterrorism operations eliminated dozens of al Qaeda (AQ) facilitators and exerted pressure on AQ personnel, restricting their movement to isolated areas of northeastern Afghanistan. ISAF estimates that the number of AQ fighters in Afghanistan remains very low, but AQ’s relationship with local Afghan Taliban remains intact. The transition process is on track for completion by the end of 2014, with four of five tranches of provincial districts fully in transition, and the fifth tranche entering transition this summer.2 President Karzai announced tranche four on December 31, 2012, and all districts in this tranche began transition by March 2013. With tranche four now underway, approximately 87 percent of the Afghan population is living in areas where transition has occurred or is occurring and 23 of Afghanistan’s 34 provinces are wholly in transition. Tranche four moved Afghans into the lead for security in important population centers, economically significant districts and large areas in the east and center of the country. Tranche five was announced this spring and will be implemented in late summer; it will include all remaining districts in Afghanistan, most of which are along the border with Pakistan. Areas that enter transition undergo several stages of progress that gradually increase Afghan control. Areas that reach the final stage of transition remain at that stage until December 2014 when all provinces and districts in Afghanistan will graduate from transition, regardless of what stage they have achieved. As U.S. and coalition forces draw down and re-posture, the ANSF is taking the lead in transitioned areas and helping to expand Afghan government influence, most notably in Regional Command–North (RC-N), where ISAF forces have substantially reduced their coverage. Transition is a dynamic and uneven process, with some areas progressing quickly and others moving slowly or even regressing. Notably, some areas of Badakshan Province saw increased insurgent attacks with the ANSF taking significant casualties, indicating that ISAF will continue to have to assess the pace and scope of transition to prevent premature withdrawal and to learn appropriate lessons to make the transition process more effective. Overall, relations between Pakistan and the United States have stabilized. Although Pakistan and Afghanistan both acknowledge that stability in Afghanistan impacts Pakistan and vice versa, relations between the two nations continue to be rocky and dominated by mistrust. Bilateral visits between Pakistani and Afghan leaders increased during the past year, including recent high-level visits to Afghanistan by Foreign Minister Khar and Chief of Army Staff General Kayani and by Minister of Defense Bismillah Khan Mohammadi and Afghan High Peace Council Chairman Rabbani to Pakistan. In February 2013, during a trilateral meeting in the United Kingdom, President Karzai and President Zadari agreed to strengthen bilateral efforts to further the Afghan-led peace process and reconciliation and to advance regional peace and stability. The United States and other coalition nations also began transporting a small amount of materiel into and out of Afghanistan through the Pakistani ground lines of communication (GLOC), greatly reducing the transportation time and cost of using other routes. As of the end of the reporting period, the Pakistani GLOC was capable of handling all of the cargo headed into and out of Afghanistan. Afghanistan-Pakistan military-to-military coordination has strengthened, including joint border operations and the possibility of future officer training exchanges. Nonetheless, cooperation along the border remains uneven. Some Pakistani insurgents have fled into Afghanistan and have then conducted attacks into Pakistan. Despite increased bilateral communication in some areas, frequent Afghan and Pakistani accusations of cross-border artillery strikes into each other’s territory persist. Pakistan has conducted counterinsurgency operations mainly against Pakistan-focused militants and not against the Afghan-focused insurgents located in western Pakistan. In some areas, however, these operations have restricted the operating space and resources of these insurgents. Pakistan has also provided support to the Afghan-to-Afghan reconciliation process. The ongoing security transition and preparations for the upcoming political transition have created a set of challenging issues in bilateral relations between the United States and Afghanistan. Bilateral relations reached a high point at the meeting between President Karzai and President Obama on January 11, 2013. The two presidents reaffirmed the Afghan-American relationship and commitment to our shared strategy. They discussed the significant security progress of the last two years and the transition to ANSF lead; the impressive development gains in Afghanistan over the past decade and the need for continued, sustainable progress; preparations for the upcoming election and Afghan plans to ensure that it is a fair and inclusive electoral process; and the regional situation including building strong ties between Afghanistan and its neighbors. They also agreed on a way forward for transfering the Afghan detainees held by US Forces-Afghanistan (USFOR-A) at the U.S. Detention Facility at Parwan. Finally, both presidents committed to concluding the BSA (which both nations began negotiating in November 2012) as soon as possible, reaffirming that such an agreement is in both countries’ interests. Bilateral relations faced challenges in the months after the presidential meeting. In late February 2013, President Karzai ordered U.S. forces out of Wardak Province in response to accusations that they were organizing Afghan forces who were abusing Afghans. After subsequent investigations revealed that the accusations of abuse were false, ISAF and the Afghan government reached an agreement on a plan to accelerate security transition in Wardak to the ANSF. In early March, disagreements over implementation of the way forward decided in January 2013 delayed the scheduled handover of Afghan detainees held by the United States at the Detention Facility at Parwan. Following in-depth discussions, the U.S. and Afghan governments signed a new memorandum of understanding (MOU) on March 25 to transfer custody over Afghan detainees and control of the detention facility to the Afghan government. The MOU provides for access to detainees in Afghan custody by nongovernmental organizations so they can monitor their treatment. In mid-March, President Karzai publicly implied that the Taliban and the United States were working in concert to show that violence would worsen if coalition forces leave after 2014. ISAF categorically denied this allegation, and President Karzai later indicated that his comments had been misinterpreted by the media. President Karzai’s comment, the drawn-out negotiations over the transfer of Afghan detainees and the Wardak Province security transition strained cooperation between the United States and Afghanistan during the reporting period. Effective governance, the rule of law and sustainable economic development are all necessary for long-term stability in Afghanistan but muultiple factors continue to hinder them, including widespread corruption; limited education and skill levels; minimal access by officials to rural areas due to a lack of security; a lack of coordination between the central government and the Afghan provinces and districts; and an uneven and evolving distribution of power among the judicial, legislative and executive branches. Afghan government capacity to to provide stable and responsive governance to the Afghan population continues to develop although progress is slow and uneven. Revenue generation, including tax collection at the municipal level, has steadily improved, but execution of the development budget remains below targets in some areas. The Afghan government is highly centralized, with revenue, budgeting, spending and service delivery authority residing with the central ministries in Kabul, limiting the efficiency of service delivery at the provincial and district levels. Decentralization is slowed by limited human capital resulting from low education levels and skillsets and migration of many Afghans to other countries as a result of decades of conflict as well as from delays in enactment of structural reforms by the central government. There are some parts of the government that do have relatively effective service delivery, such as the Ministry of Public Health and the Ministry of Rural Rehabilitation and Development. The July 2012 Tokyo Conference recognized many of these issues, and the resulting Tokyo Mutual Accountability Framework (TMAF) included specific commitments by the Afghans to address some of the major weaknesses in sub-national governance. To date, the Afghan government has made limited progress in meeting its TMAF commitments and implementing required structural reforms. Economic growth and development in Afghanistan will continue to be led through 2014 by investments in construction and by private consumption driven largely by donor contributions and ISAF spending for services. The macroeconomic effects of the reduction in ISAF personnel during the previous reporting period remain unclear, although as ISAF continues to drawdown, economic growth will likely be affected. The donor funding commitments made in Tokyo provided an important signal from the international community that there will be continued funding post-2014 to support the Afghan economy and mitigate the effects of transition, particularly because the economy does not yet have a basis for sustained growth without such assistance. The non-opium agricultural sector comprises about half of total GDP, according to the World Bank, and about 75 percent of the population lives in rural areas where agriculture is the primary economic activity. Opium production, however, remains a substantial portion of overall agriculture output and will continue to fuel corruption and fund the insurgency, undermining good governance and hindering efforts to improve security. Mining accounts for a marginal share of GDP but has the potential to expand if the government implements pending legislation to modernize the rules and regulations governing this sector. The information technology sector, particularly telecommunications, is one area of Afghanistan’s economy that is showing continued growth. Investor fears about political risk and the security situation make it particularly important for Afghanistan to show progress in regulatory reforms and the completion of major infrastructure projects. No major infrastructure projects were scheduled for completion during the reporting period. The Cabinet of Ministers approved in February a draft mining law that is now pending Parliament’s approval. The Afghan population continues to benefit from the vast improvements in social development made over the past decade, particularly in health and education, although access and availability is limited outside population centers. During the reporting period, several Kabul Bank employees, including the former chairman and former CEO, were convicted of breach of trust, assessed heavy voluntary fines and sentenced to five years in prison. However, several politically connected beneficiaries of the Kabul Bank scheme have yet to be indicted. Sustaining governance, development and security gains beyond 2014 will depend in large part upon a successful presidential election and a smooth transfer of power. The Afghan government agreed in the U.S.–Afghan Strategic Partnership Agreement and the TMAF to promote free, fair, inclusive and transparent elections. U.S. assistance is designed to help them meet that goal. The U.S. government has provided substantial support for election preparations including technical advice and funding for Afghanistan’s independent election institutions and capacity building for civil society and political groups. Afghanistan is currently working to establish election legislation and operational plans by the deadlines established in the TMAF. Challenges in governance and sustainable economic development continue to slow the reinforcement of security gains. Ongoing insurgent operations and influence in parts of the country continues to inhibit economic development and improvements in governance. Unqualified and corrupt political officials in parts of the central government undermine government efficacy and credibility, threatening the long-term stability of Afghanistan. During the reporting period, the Afghan government's counter-corruption efforts have shown no substantial progress, apart from the public acknowledgement that large-scale corruption exists. ISAF has largely shifted to a Security Force Assistance (SFA) mission focused on improving the ANSF’s capabilities rather than fighting the insurgency directly. The SFA model calls for advisor teams to train, advise and assist (TAA) the ANSF at the tactical and operational levels until they are able to conduct operations independently. In some cases, SFA Teams (SFATs) are supported by SFA Brigades (SFABs), which have replaced U.S. combat brigades as those brigades redeploy. SFABs are redesigned maneuver units that manage risk, oversee force protection and provide key support to SFATs when necessary. During the reporting period, six U.S. combat brigades were drawn down and eight SFABs were deployed. The SFAT model also reflects an evolution in how ISAF solicits partner nation troop contributions, moving from a focus on geographic areas of responsibility to a model more focused on ANSF unit sponsorship. Each SFAT is tailored to include individuals with specific skills associated with the ANSF unit to which it is assigned. Each troop-contributing nation determines its SFATs’ composition and disposition in order to meet ISAF requirements. Currently, the Supreme Headquarters Allied Powers Europe (SHAPE) has established requirements for 460 SFATs; as of the end of the reporting period there is a shortfall of 60 SFATs. The near-term challenge for NATO is to enlist the support of troop-contributing nations that have specific and readily usable and transferable skill sets for SFATs. SFAT requirements will decrease through 2013 as the ANSF improves its ability to independently conduct operations. ISAF has always used a comprehensive approach to assessing the campaign by considering a wide array of metrics that address security, economic, governance and other trends. Public reports such as this have, however, placed too much emphasis on enemy-initiated attacks (EIAs) as a single measure of progress. As the nature of the conflict has evolved, it has become clear that a tally of EIAs is not now, nor was it ever, the most complete measure of the campaign's progress. At a time when more than 80 percent of EIAs are happening in areas where less than 20 percent of Afghans live—a result of ISAF’s and the ANSF’s success in driving the insurgency out of populated areas—this single facet of the campaign has become significantly less relevant in evaluating progress against the insurgency. Improvements in the capabilities of the ANSF and progress in governance and development are far more indicative of success in Afghanistan than the total number of EIAs. EIA trends, localized historical comparisons and a large number of other metrics are still accurate and are used throughout this report. This report will, however, no longer use nationwide EIA totals and historical comparisons of these totals as a main metric of success in Afghanistan. A key reason for this change in emphasis is that ISAF no longer has the ability to report most EIAs. As it shifts from a combat mission and as the number of forces in theater rapidly declines, ISAF is involved in a smaller share of tactical incidents that would be reported as compared with a year ago. Instead, EIAs are now primarily an ANSF reporting responsibility. Although EIA data are still a useable metric and comparisons with previous years are still valid under certain circumstances, the previous depth of analysis and assessments is no longer as central to assessing progress toward security and stability in Afghanistan. In January 2013, ISAF discovered that a number of EIAs reported from independent ANSF operations had not been included in its database. 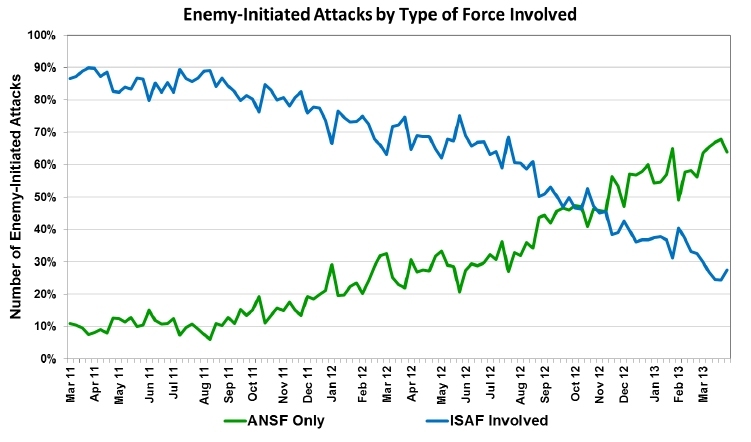 The ANSF had accurately reported these data, but ISAF mistakenly did not enter them into its main metrics database. An internal audit resulted in a revision of 2012 EIA totals from being down seven percent compared to 2011 to no change in the totals. The error revealed by the discovery in January has since been corrected, and all EIA-related data used in this report uses these corrected data. The following four figures better illustrate the significant changes that have led to the shift in ISAF’s mission during the reporting period. Figure 1 illustrates the total number of friendly forces fighting in Afghanistan (coalition and ANSF) (not counting Afghan Local Police, which adds approximately 20,000 personnel). As the ANSF has grown in size it has taken on a correspondingly greater role in the fight against the insurgency. 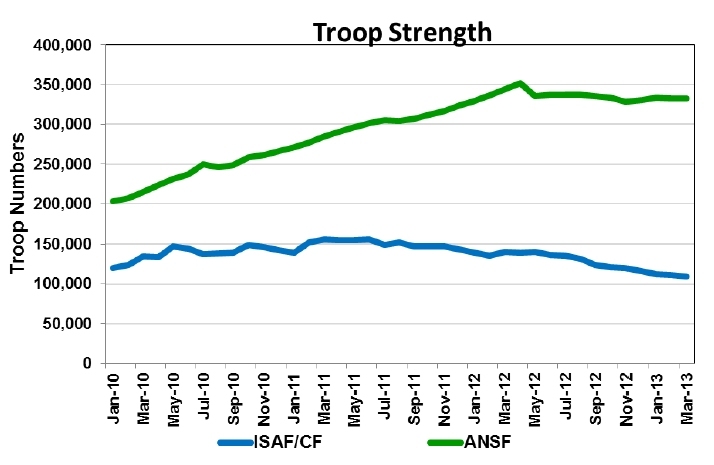 Figure One: ANSF and ISAF personnel, January 2010 – March 2013. Figure 2 illustrates the number of ISAF personnel killed in action (KIA) and ANSF KIAs3. 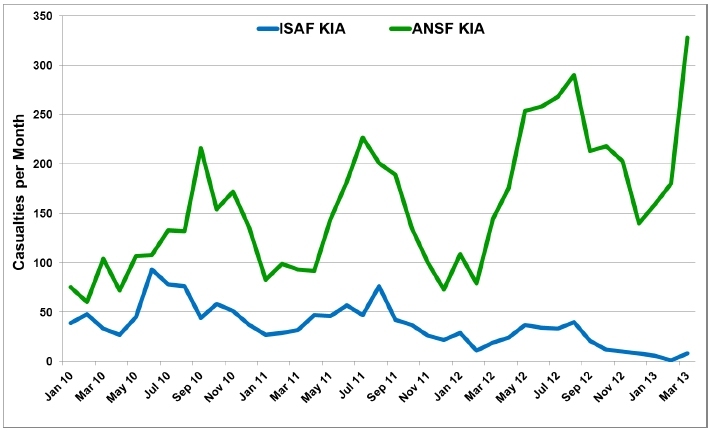 ISAF is bearing a shrinking share of total KIAs and casualties as the ANSF has assumed the lead role in security. 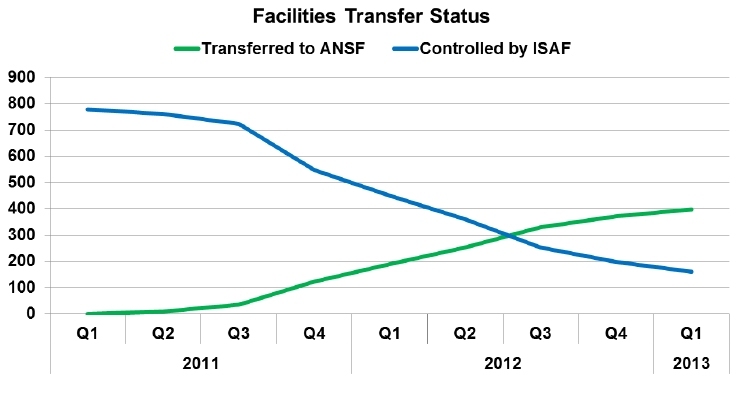 Figure Two: ANSF and ISAF KIAs, January 2010 – March, 2013. Figure 3 illustrates the percentage of EIAs involving ISAF and the percentage of EIAs involving ANSF. This graph reflects the growing capabilities and operations of the ANSF and the declining role ISAF is playing in direct combat. Figure Three: EIAs involving ISAF and EIAs involving the ANSF, March 2011 – March 2013. Figure Four: ISAF bases transferred to ANSF, October 2009 – March 2013. 1 This report is submitted consistent with section 1230 of the National Defense Authorization Act for Fiscal Year 2008 (Public Law 110-181), as amended. It includes a description of the comprehensive strategy of the United States for security and stability in Afghanistan This report is the eleventh in a series of reports required every 180 days through fiscal year 2014 and has been prepared in coordination with the Secretary of State, the Office of Management and Budget, the Director of National Intelligence, the Attorney General, the Administrator of the Drug Enforcement Administration, the Administrator of the United States Agency for International Development, the Secretary of the Treasury, and the Secretary of Agriculture. This assessment complements other reports and information about Afghanistan provided to Congress; however, it is not intended as a single source of all information about the combined efforts or the future strategy of the United States, its coalition partners, or Afghanistan. The information contained in this report is valid as of March 31, 2013. 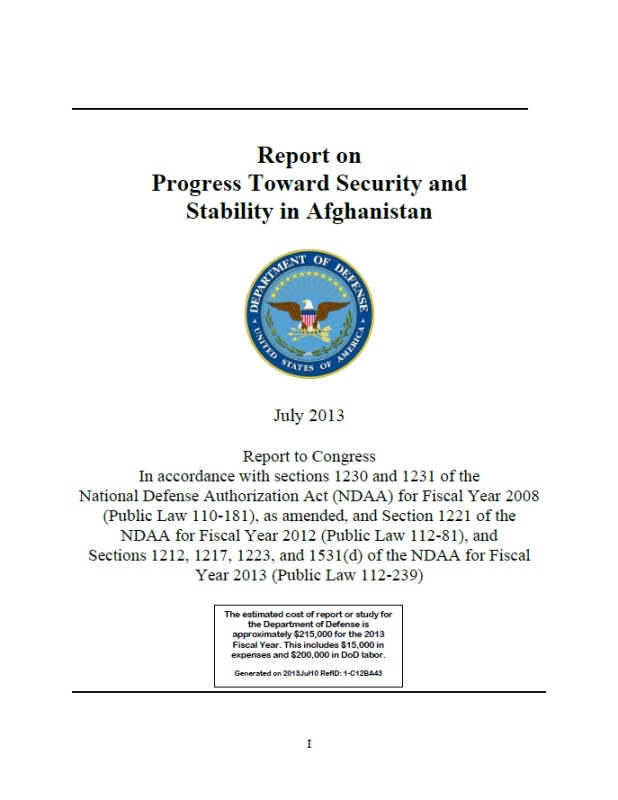 This is a historical document that covers progress in Afghanistan from October 1, 2012, to March 31, 2013 although some more recent updates of key events are included. The next report will include an analysis of progress toward security and stability from April 1, 2013, to September 30, 2013. 2 In accordance with the 2010 Inteqal (Transition) Framework, which establishes the Afghan-led process, transition will occur in phases based on the selection of five geographic areas, or “tranches.” The first fourhave already entered transition. The fifth tranche began entering transition in June, 2013. 3 ANSF casualty numbers are based on ISAF Operational Reporting. ISAF operational reporting is expected to under-represent the actual number of ANSF casualties. The accuracy of Afghan reports for ANSF casualties is unknown.